Taekwondo uniforms (typically called a dobok; also commonly known as a gi, but that is the Japanese word for them) are common for practitioners to wear. They are usually a plain, white, v-neck heavy cotton top with pants that have an elastic waist. The top is similar to a jacket, open in the front. It is tied together by a belt. One comparison for the top could be a bathrobe. Many bathrobes are tied together as well. 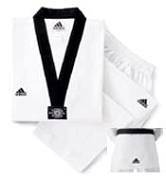 This style of clothing for taekwondo uniforms serves a few purposes. One, everyone is wearing the same clothing. It doesn't matter who you are or where you come from. Everyone is equal. The only thing that distinguishes one from another is the color of the belt, which is discussed later. The top and pants are both comfortable and allow a lot of movement, a definite necessity of taekwondo. It makes practicing much easier. Belts - Many martial art systems make use of the belt system. Belts are used not only for closing the top, but are also a ranking system. The color of your belt depends on your skill level. As you progress, you will get a new belt signifying your skill as a practitioner. The general ranking system is below. Beginners all start as a white belt.